How often do you get back to RPG basics? he only reason why my Level 80 paladin left the gates of Stormwind and galloped on horseback into Elwynn Forest, World of Warcraft's human starting zone, was to test a spell macro for that evening's 10-man run — a run during which, as a matter of fact, my group would defeat two of the game's most difficult bosses for the first time. 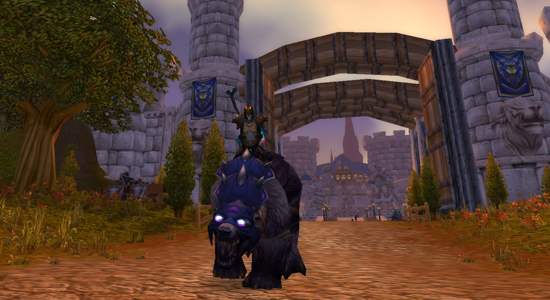 And yet for all the returning hero's magnificence, those quaint trees and the trifling things they hid — wolves, cutpurses, boars, and bears — set the most inviting scene I had stepped into after weeks of exciting progression raiding and the leveling of a third character to endgame. In a game whose goals are advancement and ascension to monumental challenges in faraway places, I wanted nothing more than to start another character in the humble, little glen encircling Northshire Abbey. Few games retain players' interest and commitment at maximum level as well as World of Warcraft; we all know how power in video games doesn't so much corrupt as simply jade. But the appeal of formative levels — of breaking in an unfamiliar class while collecting every bauble, trinket, and tooth as if it were treasure — is no less impressive. Been re-rolling lately? How often do you set aside your champion to get back to basics?